Add some flare and unique sophistication to your space. Acrylic adds such personality to a room and many designers are jumping at a chance to design new pieces. 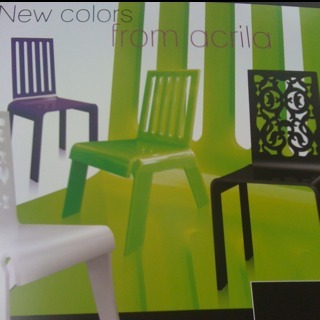 At Acrila designers such as Jean Christophe Bernard plays with color and transparency with this line of chairs. Offered in trendy colors this will add a dimension of exclusivity to your design space whether at home or an office. Check out www.Acrila.com to see the endless options available!